Spoon's boat noodles. Perfectly legal. From Alice B. Toklas brownies to the contraband delights of the Muffin Lady, culinary applications for marijuana tend to be more about creating a palatable delivery vehicle for an intoxicating but irredeemably pungent ingredient rather than showcasing the flavor on its own terms. There's a reason they call it grass. For Weed Week, I took an informal survey of chefs, wondering if any had tried to make something of its flavor in addition to its mojo. Those I heard from worked with it both recreationally and professionally, usually infusing oils or butters with it and going from there. Most described methods meant to minimize or disguise the flavor and odor. The butter turns very green and gets an earthy smell/flavor. The best way is to boil the butter and herb in a bunch of water for a couple hours. Then cool, and when butter is solidified you simply lift it off. The beauty of this is that the water absorbs a lot of the stink. It is strong enough that you want to avoid delicate flavors. Another thing to consider is that people who get high generally like the stink a lot. I don't know why anyone would sprinkle such an expensive weed on anything if the goal was not to get high. The things you can do are endless. Most French food is finished with butter. A lot of pasta is finished with butter. Think about ricotta gnudi with lemon-caper "green" butter. I once did a nine-course tasting menu for friends. It takes 45 minutes to an hour for the pot to kick in. This means that they don't feel anything until halfway through, and by the end they are wasted and completely stuffed. You can just do shots of it or rub it on your skin as well for an equally effective yet lower-calorie buzz. Some people have added it to water or their cocktail, as the taste alone is not amazing and can be tough for some to swallow. I have a great method that only requires a small amount of herbage and is cholesterol free. Once it's prepared you can cook anything with it, rub it on your skin, drink it, whatever. I don't use butter because (obviously) it's not vegan. Only one chef, a Los Angeles-based semicelebrity, was actually seasoning with it. He e-mailed me a detailed recipe for "Nantucket Bay Scallops, Salted Duck Egg, Congee, Sweet Coconut, and Cannabis Pesto." He's planning to serve it at an "herb" dinner to be held in the coming months and insists that the dish isn't about getting high. The recipe calls for two ounces of spinach and three ounces of basil. The teaspoon of blanched marijuana it calls for seems tame in comparison. When I asked him how the pesto tastes, he went back underground. 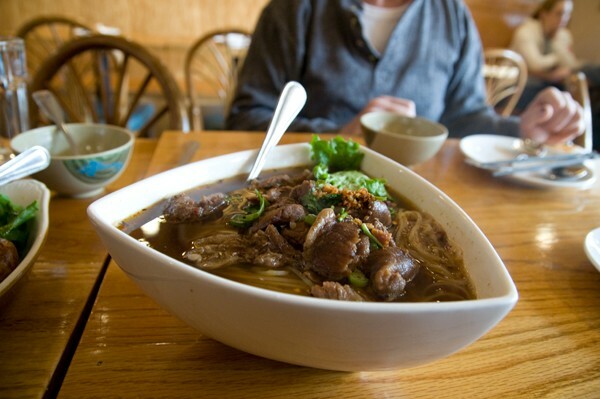 kuai tiao ruea, a fragrant, beefy rice-noodle soup swimming with offal and meatballs, is traditionally sold from boats anchored along canals, though these days more often from shops. There's surprisingly little trustworthy information in English on the origins of this family of noodle soups, but anecdotally it's often said that they are—or once were—seasoned with marijuana. There appears to be enough anecdotal evidence to support the hypothesis (urban legend?) that marijuana is indeed used in the making of boat noodle broth—at least in the old days. But there's no documentation from a reliable source. It's like we kind of know, or suspect, that marijuana may be involved (the broth smells like it, you get abnormally thirsty after a boat noodle meal and you know it's not due to MSG, people reportedly see a cook add a bundle of it into the stock pot, etc. ), but nobody has ever investigated the matter as far as I know. Assuming marijuana is used, I think it's used—primarily if not solely—as a seasoning. The traditional boat noodle spice blend is one of the most guarded secret formulae in the Thai street (in this case, canal) food world. And if marijuana is part of the original spice blend, it's not a surprise. While many today think that vendors sneak marijuana into the broth for the purpose of getting diners addicted to their noodles, I think originally it was probably used as a way to mask the gaminess of the beef (before farming). After all, as far as I know, it's the male marijuana that's used in food, not the female one that you smoke. I figure the amount they use can't be so large that people can get high from it anyway. Some suggest that since marijuana increases one's appetite, it explains why an average person can eat 10-20 bowls of boat noodles in one sitting. But this assumption fails to take into consideration that a bowl of boat noodles is only slightly bigger than your fist and each bowl contains no more than a couple bites. Boat noodles can be had at the city's better Thai restaurants—Spoon, TAC, Sticky Rice, Aroy—but the bowls are much bigger than ones Leela's talking about, and there's certainly no cannabis in the broth. You'll just have to add your own.